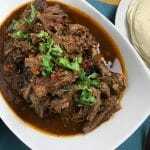 This Instant Pot Carne Guisada is a flavorful twist on ordinary pot roast and perfect for anyone who likes Mexican food. 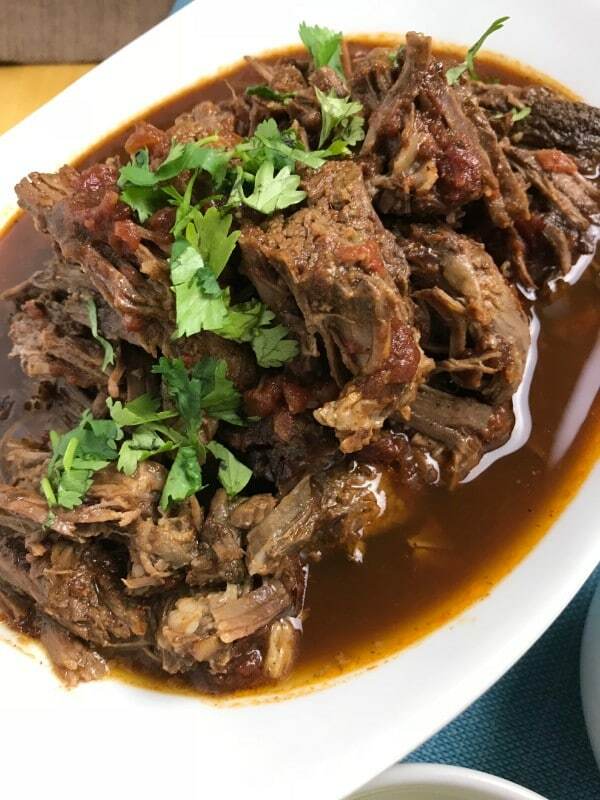 And like almost all of my Instant Pot recipes, this Mexican pot roast is super easy to make! 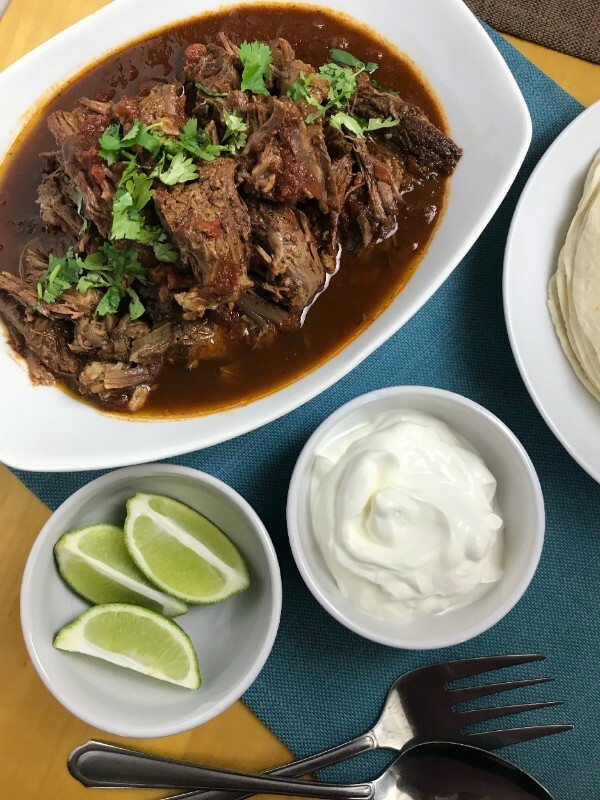 One of the best things about any electric pressure cooker is how well they work at turning inexpensive cuts of beef into tender, mouthwatering chunks of beef loaded with flavor. You won’t get the same result when you make this on a stove top. And though a crock pot does wonders for chuck roast, you have to remember to start dinner as soon as you’ve finished eating breakfast. That being said, this recipe isn’t one that is ready quickly. You’ll spend about 15 minutes on the front end getting it ready to pressure cook, then you’ll have to allow the time for pressure to build up, 50 minutes of pressure cook time, and then time for a natural release. Plus, you need some time after it’s cooked to shred the beef and thicken the sauce. Altogether, you’re looking at about 2 hours start to finish, but most of that time is letting the pressure cooker do the work. 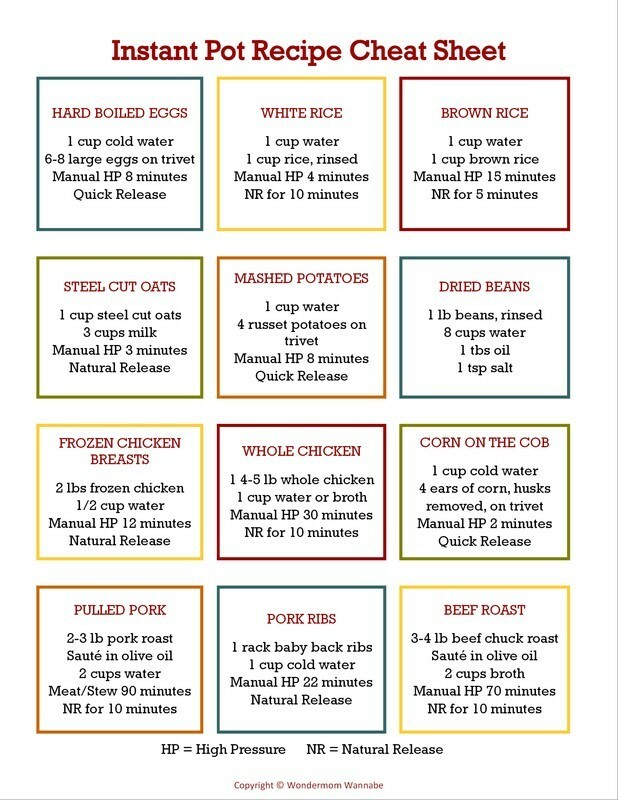 So, although it’s an easy recipe, it’s not one you’ll turn to for nights when you need to get dinner on the table in a hurry. When you have the time to plan for it though, it’s well worth the wait. The meat is tender, juicy, and tastes amazing. I like to start this right as the kids get home from school, then we have time for snacks, homework, and downtime before dinner. I recruit them to help at the end so one person can be stirring the sauce, another setting the table, while I shred the beef and yet another family member gets out the toppings. Other than the chipotle peppers, you likely already have all of these ingredients in your kitchen! First, we need to brown the roast. Press the “Sauté” button on your Instant Pot and wait until the display reads “Hot” before adding the olive oil. While you’re waiting for the pot to heat, rub the roast all over with two tablespoons of taco seasoning. After you’ve added the oil to the pot, carefully set the roast inside. Cook for 3-4 minutes on both sides to sear the top of and bottom of the roast. Then, remove it from the pot and set aside. Add the beef broth to the pot and use a wooden spoon or spatula to scrape off any bits that are stuck to the bottom of the pot. After all of the stuck on pieces have been scraped up, return the roast to the pot and cancel sauté mode.. In a small bowl, combine the tomatoes, one tablespoon of taco seasoning, the chipotle peppers and vinegar. Stir to combine, then pour over the roast. Now it’s time to let the Instant Pot take over. Secure the lid and turn the valve to “sealing.” Press “Manual” or “Pressure Cook” (high pressure) and set the time for 50 minutes. When the cook time ends, allow for a natural release (don’t move the valve to “venting” until the pin drops indicating the pressure has completely released). If you’re impatient, you can quick release sooner, but no less than 10 minutes of natural release if you want the meat to be tender enough to shred. When the pressure is fully released, carefully remove the lid. Remove the roast from the pot and use two forks to shred it. Turn the pot on sauté mode and stir the sauce until it reaches the consistency you want. If you have a kitchen helper, this is a great time to put them to work! One of you can reduce the sauce while the other shreds the beef. Your Instant Pot Carne Guisada is ready to serve! You can spoon it over rice or into tortillas. You can also eat it right out of a bowl like a beef stew. Top with sour cream, shredded cheese, fresh cilantro and/or jalapenos. Set Instant Pot to sauté mode. While waiting for pot to heat, rub roast with taco seasoning. When display reads hot, add 2 tablespoons olive oil. Place the roast in the pot and cook for 3-4 minutes on both sides to sear. Remove roast from pot and set aside. Add the beef broth to the pot to deglaze, scraping until all brown pieces are loosened. Return the roast to the pot and cancel sauté mode. In a small bowl combine tomatoes, remaining taco seasoning, chipotle peppers, and vinegar. Stir to combine. Pour over roast. Secure the lid and set valve to sealing. Set to pressure cook on high for 50 minutes. At end of cook time, allow pressure to release naturally. Remove the roast and use two forks to pull meat apart. Set Instant Pot to sauté mode and cook, stirring occasionally, until the sauce reaches your desired consistency. Return the meat to the pot to combine OR spoon the sauce over the meat when you serve. 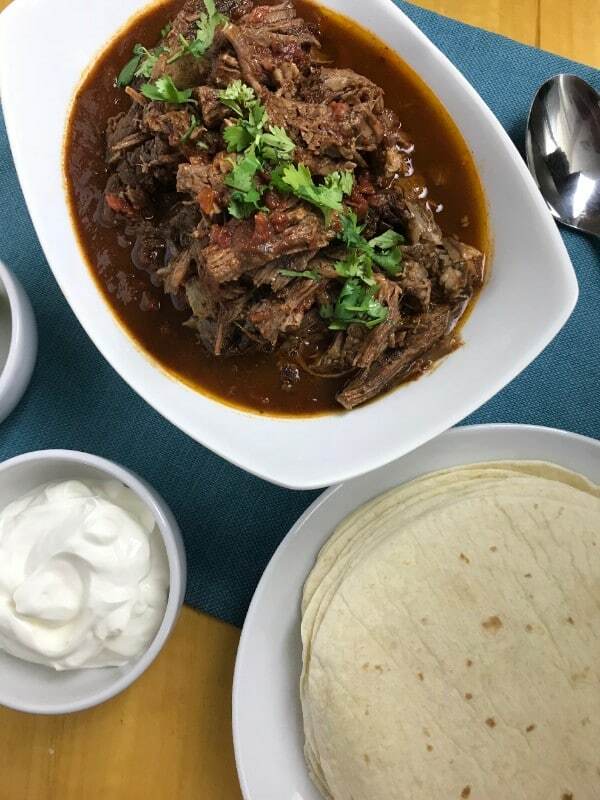 If you enjoyed this recipe, check out this collection of Instant Pot Mexican Recipes where you’ll find dozens of other recipes you might like.